Mozart was born in Salzburg, Austria in 1756. He and his sister Nannerl (Maria Anna) were introduced to music from an early age by their father, a composer and conductor who worked for the Bishop of Salzburg. The children learned rapidly and by the age of five Wolfgang was showing an outstanding ability at playing instruments. He had also composed some simple minuets. In 1762 at the age of six he began playing in public. He travelled with his family on tours to cities such as Munich, Paris and London. In 1769 at the age of 13 Mozart made the first of three tours of Italy. In 1777 he travelled to Paris with his mother. His mother died in 1779 and Mozart returned to Salzburg where he was engaged as court musician. He did not like his new post and moved to Vienna in 1781 in search of a better position. While travelling Mozart continued to compose. Though he travelled widely in Europe he never visited Ireland. However, one of his friends was the tenor and composer Michael Kelly from Dublin. They met in Vienna where Kelly had given a performance for the Emperor. Kelly met Mozart and his wife Constance for dinner and later was a regular visitor to the Mozart’s home. Michael Kelly performed the part of Don Curzio in the premiere of Mozart’s ‘The Marriage of Figaro’. During his lifetime Mozart composed more than 625 works including symphonies, concertos, and operas. His last composition, Requiem, was largely unfinished at the time of his death. He died at the age of 35 on December 5th 1791. 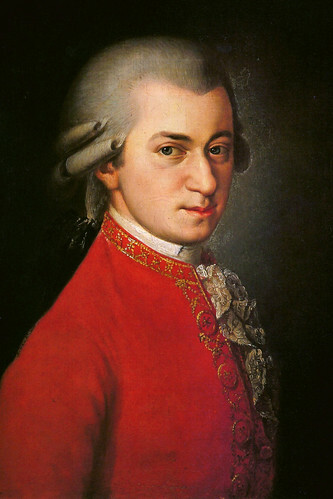 Wolfgang Amadeus Mozart was born at 9 Getreidegasse in Salzburg, Austria in the year 1756 On This Day.